An elderly woman with HTN presented with L sided chest pain, intermittent over the past week but worse over the past hour, associated with shortness of breath. She had no known history of CAD. This is quite an obvious anterior OMI, with STE in V2 with hyperacute T-waves in V2-V3, however it unfortunately does not meet STEMI criteria as there is insufficient STE in either lead V1 or V2 to have two consecutive leads. There is a small amount of coved, convex STE in aVL with a terminal T-wave inversion. There is also the beginning of a Q-wave in V2-3. Here I have stretched the image vertically (the entire image, waveform and gridlines alike). This highlights the principle of proportionality - now that hte QRS is closer to normal size, the same proportion of STE strikes you as obvious. A consult for emergent catheterization was placed, however the cardiologist was not convinced of the EKG findings. Emergent catheterization was not performed, and the patient was instead admitted to the CCU. Heparin and other antiplatelet medication was not started at this time for unclear reasons. 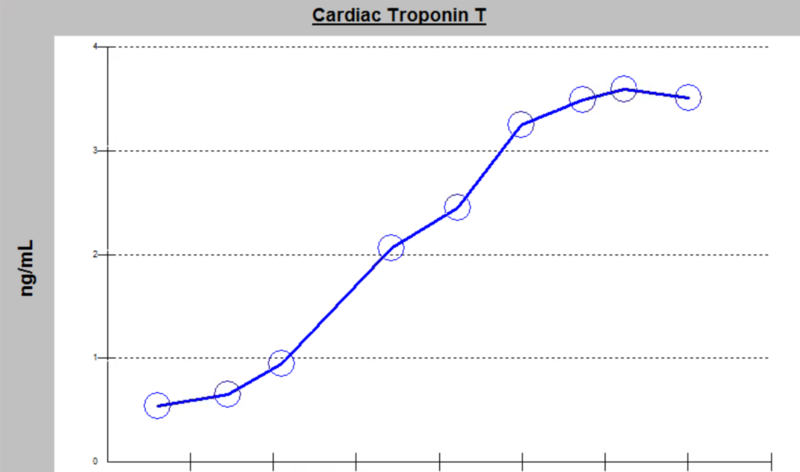 Initial troponin T returned significantly elevated at 0.51 ng/mL. Persistent STE in V2-V4. Although there is a terminally inverted T-wave in V2 (which by itself may suggest reperfusion), V3 shows persistent STE with upright, hyperacute T-wave. Q-waves are present in V2-V6. Serial troponins continue to rise. However the patient is not taken to the cath lab because these ECGs were interpreted as not meeting STEMI criteria. It is unclear whether pain is continuing at this time, however it is extremely unlikely for serial ECGs to be recorded in an asymptomatic admitted patient overnight who has already had a cardiologist decide against emergent catheterization. The patient was also given morphine, which seems unlikely in an asymptomatic patient. Therefore there was likely ongoing chest pain. Persistent STE in V2-V5. The T-wave in V2 is now upright, signifying reocclusion of that territory's blood supply. Q-waves becoming slightly more prominent, and there is no longer any R wave in V2. Heparin is finally started at this time, around 4am. Clearly meets STEMI criteria in I and aVL, with reciprocal changes in the inferior leads. Persistent STE and upright T-waves in anterior leads as before. This correlates with aVL on the first ECG, and suggests that there was some ischemia of D1 that has now become complete occlusion of D1. Because the ECG finally meets STEMI criteria, the patient is finally taken to the cath lab. A 100% thrombotic mid-LAD occlusion was discovered and stented open, with pre and post TIMI flow 0 and 3. 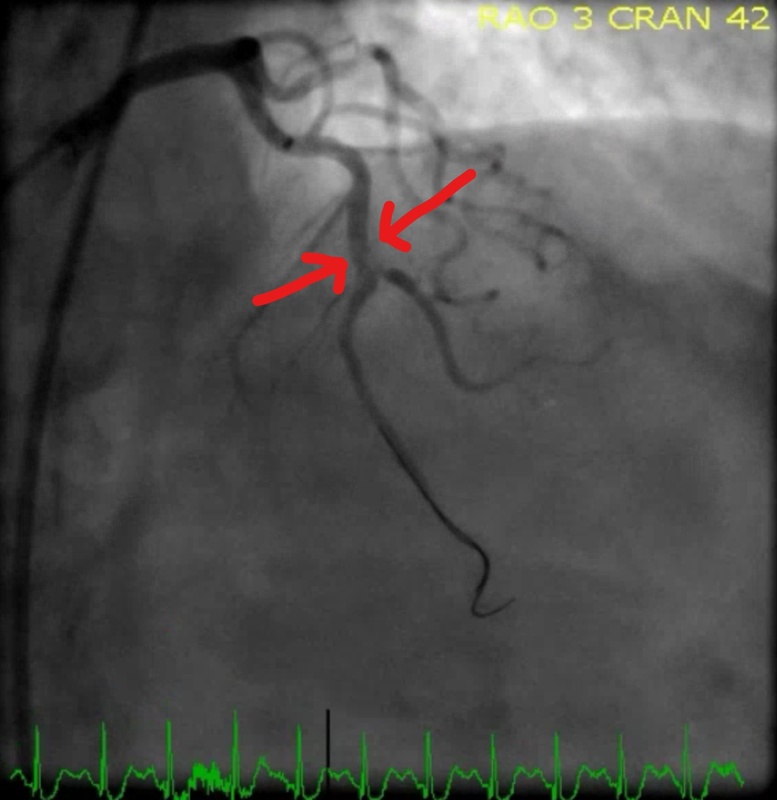 Same image with arrows showing the point of occlusion. 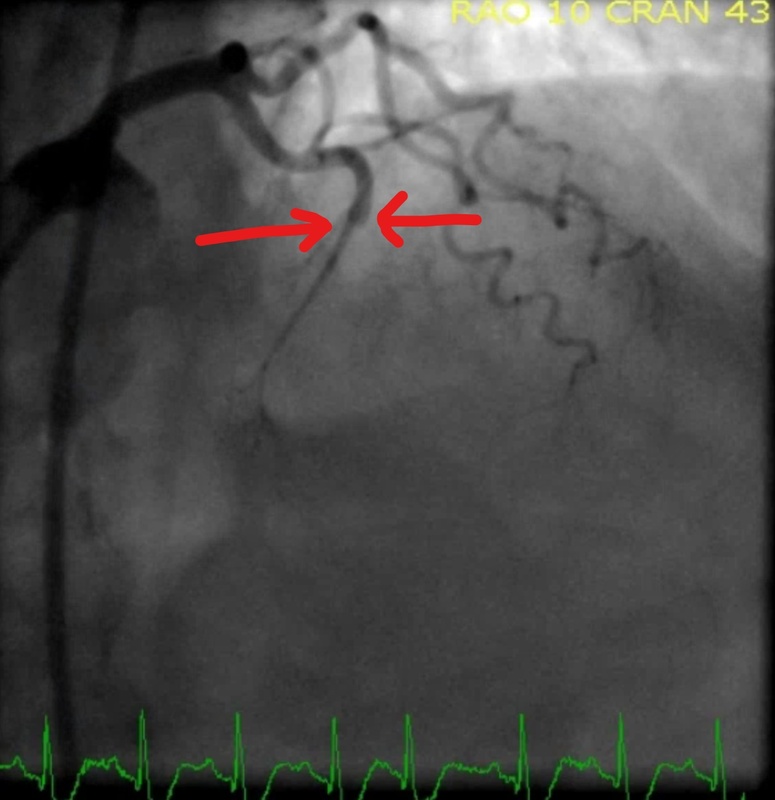 The small branch overlaid in this image extending past the arrows is a small side branch that took off before the point of LAD occlusion. Arrows showing the site of former occlusion, showing the territory beyond the site of occlusion which had been ischemic. Reduced but persistent STE in anterior and high lateral leads, indicating reperfusion. It may take hours or longer for the residual STE to disappear, or it may persist indefinitely ("LV aneurysm morphology). The STE in lateral leads has resolved, while the anterior leads have QS waves with persistent STE, likely indicating full thickness completed infarction. Peak troponin T was roughly 3.5 ng/mL. QS waves with such a high troponin (in my most recent study, the average peak troponin T of clear cut STEMIs was 3.19 ng/mL) are very unlikely to represent myocardial stunning, and much more likely to represent full thickness irreversible infarction. Echocardiogram the next day showed wall motion abnormalities of the anterior, lateral, septal, and apical regions. EF at that time was 38%. There is commonly a significant delay between the first ECG diagnostic of Occlusion MI and the presence of STEMI criteria, during which the patient loses a significant amount of myocardium. Ongoing evidence of ischemia (whether ongoing chest pain, rising troponins, ongoing ECG evidence of ischemia) despite maximal medical management mandates emergent catheterization by our current NSTEMI guidelines. You must advocate for your patients with Occlusion MI, because our current paradigm does not. One would think that there should no longer be a need for cases like this one = Wishful thinking … The fact that in 2019, a consulting cardiologist would deny the need (and potential benefit to accrue) from prompt cardiac catheterization of the elderly woman in this case — despite her initial ECG, in association with a history of recent-onset chest pain over the past week (clearly worse over the previous 1 hour) + new dyspnea tells us how much work still needs to be done among clinicians charged with recognizing acute OMI (including cardiologists! ). 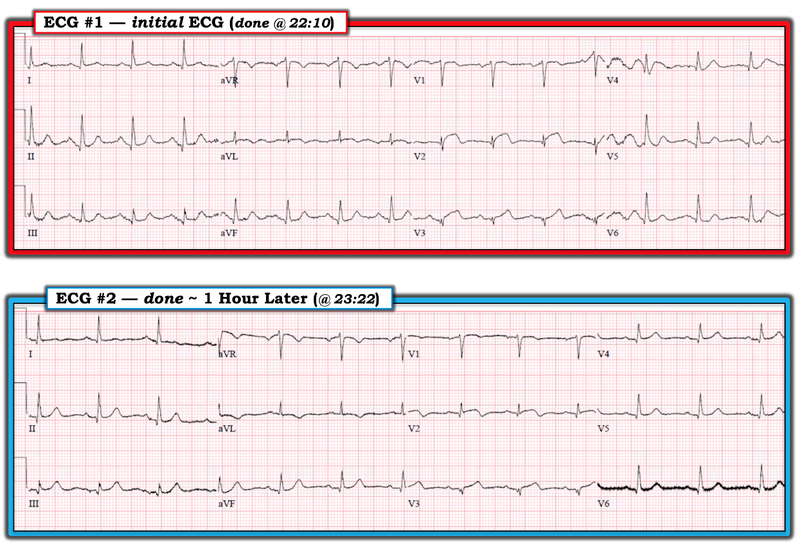 I focus my comments on ECG interpretation of the first 2 tracings in this case. For clarity — I’ve put them together in Figure-1. Figure-1: The first 2 ECGs in this case (See text). The elderly woman in this case had NO known history of coronary disease. Her symptoms of “intermittent” chest pain began over the previous week — clearly becoming worse over the hour just before she arrived in the ED. QUESTION: Looking at ECG #1 in Figure-1 — Is there anything on this tracing to suggest that she may have had a 1st event (ie, infarction) earlier during the week — and is now presenting with extension of an earlier infarction? HINT: How many leads in ECG #1 manifest Q waves? ANSWER: The reason I favor use of the memory aid, “Q-R-S-T Changes” as part of my Systematic Approach to ECG interpretation — is that doing so prevents me from overlooking which leads have Q waves — and — it prevents me from overlooking whether R Wave Progression is normal or not. In ECG #1 — small Q waves are present in leads I, II, III; aVF; and V2-thru-V6 (ie, in no less than 9 of the 12 leads! ). While true that small and narrow q waves may normally be seen in one or more lateral leads (ie, leads I, aVL; V4, V5, V6) — and sometimes normally in one or more of the inferior leads (ie, leads II, III, aVF) — the Q waves that we see in leads V2 and V3 in ECG #1 are definitely not normal! In addition to their anterior location — reasons why the Q waves in leads V2 and V3 are not normal include: i) There is loss of r wave as one moves from lead V1-to-V2; ii) In these 2 leads, which manifest predominant negativity — there is a triphasic (qrS) complex, the shape of which strongly suggests there has been infarction at some point in time; and, iii) Given the tiny QRS amplitude in these 2 leads — the Q wave in leads V2 and V3 is both relatively deep and relatively wide! BOTTOM Line: While important to appreciate a point repeatedly emphasized by Dr. Smith = that new infarction Q waves may sometimes develop VERY soon after acute coronary occlusion (ie, as soon as within the 1st hour after acute occlusion!) — it clearly is possible that the patient in this case had a 1st event (infarction) days earlier when her symptoms began — and is now showing signs of acute extension of that initial MI. — Personal Note: As a primary care Attending physician for 30 years — I saw many cases of older patients who only presented to our out-patient medical center days (or longer) after the onset of symptoms that they initially ignored — with an ECG indicative of a recent (but not acute) event. Regardless of whether numerical criteria for acute STEMI were satisfied — and regardless of whether this patient had an initial event earlier during the week — the new-onset aggravation of her symptoms (which according to the case description required morphine for relief) + the ECG signs of acute ischemia that we see in ECG #1 should be more than enough to merit prompt cardiac catheterization with the goal of acute reperfusion (See the 2nd Learning Point at the bottom of Dr. Meyers discussion). 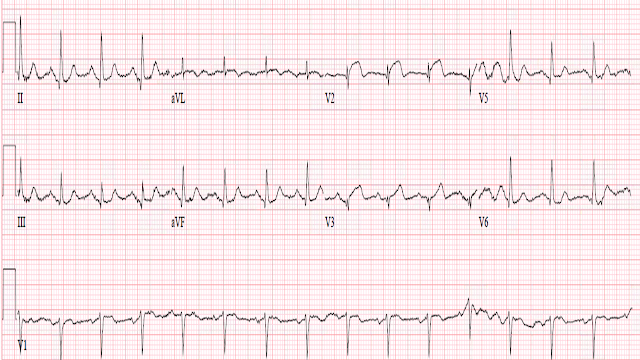 There is just NO way that the coved ( = “frowny”-configuration) ST segment in lead V2 of ECG #1 is not acute. And because of how rounded the initial part of this elevated ST segment is — there may be as much as 2 mm of J-point ST elevation (which considering the tiny QRS amplitude, is as much as the R wave in V2 is tall). In a certain sense, lead aVL is “contiguous” with lead V2 (ie, there is overlap in the area of the heart viewed by these 2 leads) — and, we see similar ST coving with slight ST elevation in lead aVL of ECG #1. The 3 QRS complexes we see in lead V3 all manifest a slightly different ST-T wave shape. Which shape is the “real” one? Regardless — the T wave for each of these 3 complexes is obviously hyperacute (dysproportionately tall) given the tiny r wave amplitude for each of the complexes in this lead. FINAL Point: I suspect there is some lead malposition in one or more of the anterior chest leads in ECG #1. 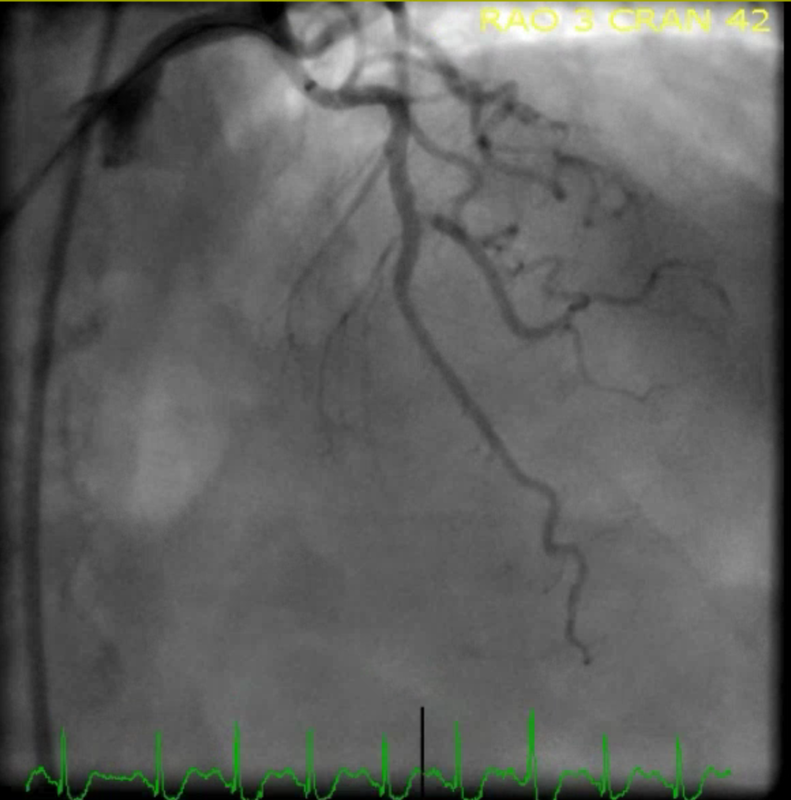 I say this because: i) Given ST coving in contiguous lead aVL — I would expect a similar shape to the ST segment in neighboring lead V3 (unless there was acute occlusion of the 1st diagonal branch of the LAD — in which case leads aVL and V2 may be the only leads showing ST elevation); ii) The finding of an R wave = 2 mm in lead V2 — that then decreases to <1 mm in V3 — but then increases again in lead V4 (to 5 mm) is counterintuitive to a physiologic R wave progression; and, iii) The P wave is non-existent in lead V2 — but shows reasonable amplitude in neighboring leads V1 and V3 — and this also does not make “physiologic sense”. NOTE: It is relevant that there may be lead malposition of one or more chest leads in ECG #1 — because a “lack of numeric criteria” for acute STEMI was apparently the reason the attending cardiologist did not promptly perform cardiac catheterization in this case — and — it is possible that immediate repeat ECG after verifying accurate chest lead placement might have resulted in an ECG that would meet numeric STEMI criteria. The ST segment in lead V2 of ECG #2 is less elevated, and T wave inversion is developing. It looks like there may be slight increase in the amount of J-point ST elevation in leads V3 and V4 of ECG #2 compared to ECG #1. Despite virtually NO change in QRS morphology/axis in the 6 limb leads between these 2 tracings — the T waves in lead III especially, but also in lead aVF look more hyperacute in ECG #2 (relatively taller and fatter-at their peak given the small R wave amplitude in these respective leads). Ideally — the 2nd ECG should have been obtained sooner than 72 minutes after the 1st ECG, since clinicians should have been contemplating whether or not acute cath is indicated. 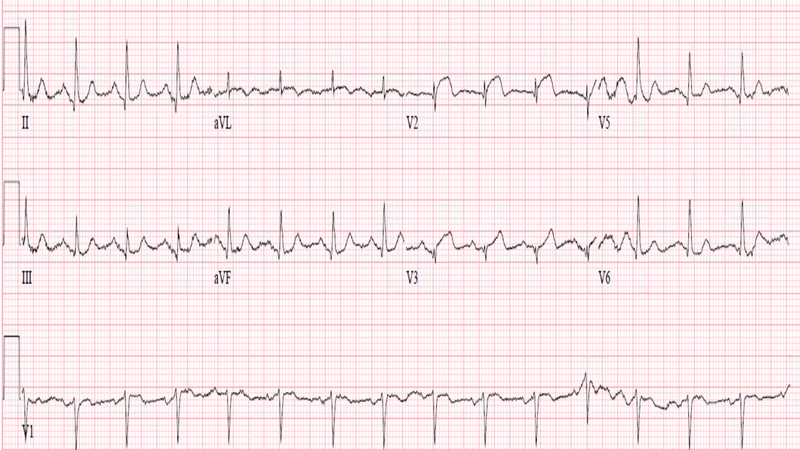 Acute evolving ECG changes often occur much sooner than one hour later. The ECG diagnosis of acute OMI will often be possible hours before “accepted” acute STEMI criteria become evident. IF your consulting cardiologist is among those who fail to recognize (or acknowledge) acute OMI on ECG in a patient with new chest pain — even when there is evidence of acute ischemia — it falls on YOU to advocate for your patients with ECG evidence of acute OMI — because (as per Dr. Meyers) — our current paradigm still does not! For “My Take” on use of the Systematic Approach to ECG Interpretation — CLICK HERE. Regarding ST segment Shape (ie, “smiley” vs “frowny” configuration) — CLICK HERE (Please see My Comment at the bottom of the page). An excellent case but a very sad and disheartening story. With a history like that I find it difficult to understand the reasoning AGAINST taking the patient to the cath lab earlier (other than "that's just not the way we've always done it" - which I don't accept, either). There also appear to be multiple unfortunate management errors regarding this patient's care. It appears that otherwise appropriate treatment was neither maximal nor timely. I get requests to speak at different functions and one of the most requested topics is "myocardial infarction mimics." This topic is really "hot" right now! Physicians and other healthcare providers appear to be terrified of diagnosing an acute MI when one is not actually present when, in fact, I think they should be more terrified of missing a real myocardial infarction when one actually IS present. I'm afraid we are entering an era in medicine in which "rules" with immutable "criteria" are replacing actual (not template-generated) history-taking and a REAL physical exam coupled with intelligent, thoughtful and deductive reasoning. There's a lot of terrific science in electrocardiography but there is also a tremendous amount of art and skill in its interpretation. The concept of OMI is a testament to that fact and this case in particular - as presented by Dr. Myers with input from Dr. Smith - certainly illustrates what can happen when automatic, fixed guidelines overrule experience, skill and advanced expertise. I wish I could say "Jones's Rule" could have intervened here, but even if it had been observed, it appears the ball had unfortunately already been dropped. Thank you for your comment Jerry! Do you have any suggestions as to HOW to get the notion of acute OMI into future Guidelines (to replace "STEMI")?